The cell cycle is an ordered series of events involving cell growth and cell division that produces two new daughter cells. Cells on the path to cell division proceed through a series of precisely timed and carefully regulated stages of growth, DNA replication, and division that produces two identical (clone) cells. 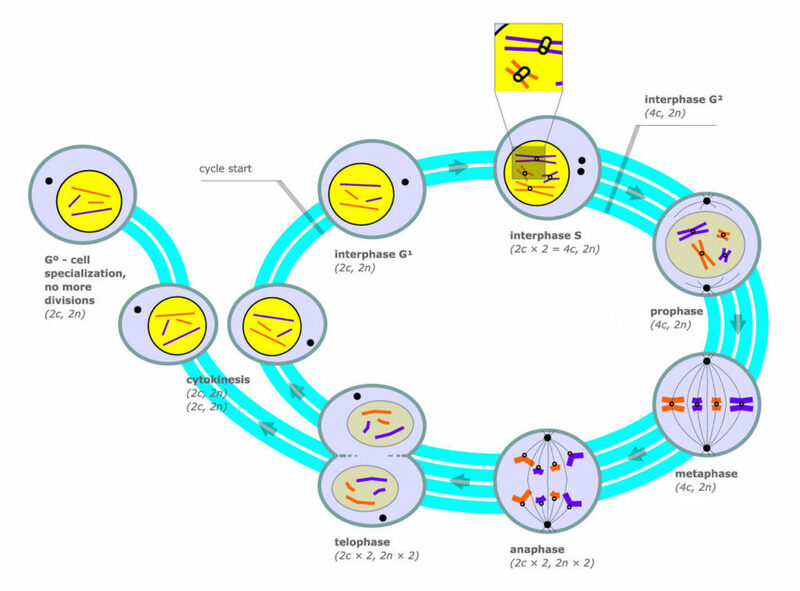 The cell cycle has two major phases: interphase and the mitotic phase (Figure 1). During interphase, the cell grows and DNA is replicated. During the mitotic phase, the replicated DNA and cytoplasmic contents are separated, and the cell divides. During interphase, the cell undergoes normal growth processes while also preparing for cell division. In order for a cell to move from interphase into the mitotic phase, many internal and external conditions must be met. The three stages of interphase are called G1, S, and G2. The first stage of interphase is called the G1 phase (first gap) because, from a microscopic aspect, little change is visible. However, during the G1 stage, the cell is quite active at the biochemical level. The cell is accumulating the building blocks of chromosomal DNA and the associated proteins as well as accumulating sufficient energy reserves to complete the task of replicating each chromosome in the nucleus. The mitotic phase (also known as M phase) is a multistep process during which the duplicated chromosomes are aligned, separated, and move into two new, identical daughter cells. The first portion of the mitotic phase is called karyokinesis, or nuclear division. The second portion of the mitotic phase, called cytokinesis, is the physical separation of the cytoplasmic components into the two daughter cells. Karyokinesis, also known as mitosis, is divided into a series of phases—prophase, prometaphase, metaphase, anaphase, and telophase—that result in the division of the cell (Figure 2). During prophase, the “first phase,” the nuclear envelope starts to dissociate into small vesicles, and the membranous organelles (such as the Golgi complex or Golgi apparatus, and endoplasmic reticulum), fragment and disperse toward the periphery of the cell. The nucleolus disappears (disperses). The centrosomes begin to move to opposite poles of the cell. Microtubules that will form the mitotic spindle extend between the centrosomes, pushing them farther apart as the microtubule fibers lengthen. The sister chromatids begin to coil more tightly with the aid of condensin proteins and become visible under a light microscope. Figure 3. During prometaphase, mitotic spindle microtubules from opposite poles attach to each sister chromatid at the kinetochore. In anaphase, the connection between the sister chromatids breaks down, and the microtubules pull the chromosomes toward opposite poles. 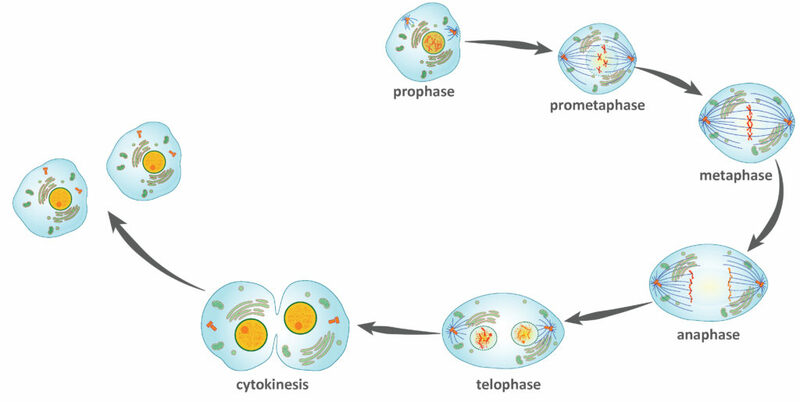 During prometaphase, the “first change phase,” many processes that were begun in prophase continue to advance. The remnants of the nuclear envelope fragment. The mitotic spindle continues to develop as more microtubules assemble and stretch across the length of the former nuclear area. Chromosomes become more condensed and discrete. Each sister chromatid develops a protein structure called a kinetochore in the centromeric region (Figure 3). The proteins of the kinetochore attract and bind mitotic spindle microtubules. As the spindle microtubules extend from the centrosomes, some of these microtubules come into contact with and firmly bind to the kinetochores. 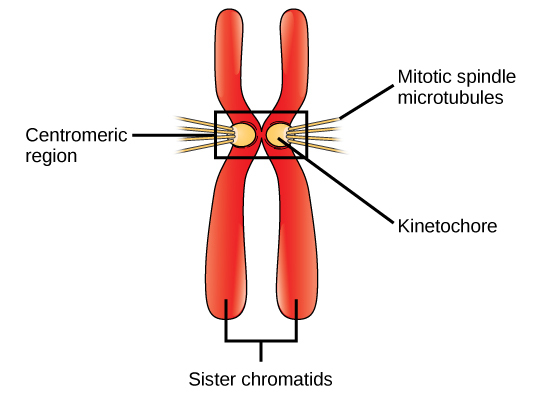 Once a mitotic fiber attaches to a chromosome, the chromosome will be oriented until the kinetochores of sister chromatids face the opposite poles. Eventually, all the sister chromatids will be attached via their kinetochores to microtubules from opposing poles. Spindle microtubules that do not engage the chromosomes are called polar microtubules. These microtubules overlap each other midway between the two poles and contribute to cell elongation. Astral microtubules are located near the poles, aid in spindle orientation, and are required for the regulation of mitosis. During metaphase, the “change phase,” all the chromosomes are aligned in a plane called the metaphase plate, or the equatorial plane, midway between the two poles of the cell. The sister chromatids are still tightly attached to each other by cohesin proteins. At this time, the chromosomes are maximally condensed. During anaphase, the “upward phase,” the cohesin proteins degrade, and the sister chromatids separate at the centromere. Each chromatid, now called a chromosome, is pulled rapidly toward the centrosome to which its microtubule is attached. The cell becomes visibly elongated (oval shaped) as the polar microtubules slide against each other at the metaphase plate where they overlap. During telophase, the “distance phase,” the chromosomes reach the opposite poles and begin to decondense (unravel), relaxing into a chromatin configuration. The mitotic spindles are depolymerized into tubulin monomers that will be used to assemble cytoskeletal components for each daughter cell. Nuclear envelopes form around the chromosomes, and nucleosomes appear within the nuclear area. The activity below will walk you through mitosis—providing you with the chance to review the different steps of the process and how they work together. Click here for a text-only version of the activity. Cytokinesis, or “cell motion,” is the second main stage of the mitotic phase during which cell division is completed via the physical separation of the cytoplasmic components into two daughter cells. Division is not complete until the cell components have been apportioned and completely separated into the two daughter cells. Although the stages of mitosis are similar for most eukaryotes, the process of cytokinesis is quite different for eukaryotes that have cell walls, such as plant cells. In cells such as animal cells that lack cell walls, cytokinesis follows the onset of anaphase. A contractile ring composed of actin filaments forms just inside the plasma membrane at the former metaphase plate. The actin filaments pull the equator of the cell inward, forming a fissure. This fissure, or “crack,” is called the cleavage furrow. The furrow deepens as the actin ring contracts, and eventually the membrane is cleaved in two (Figure 4). Figure 4. During cytokinesis in animal cells, a ring of actin filaments forms at the metaphase plate. The ring contracts, forming a cleavage furrow, which divides the cell in two. In plant cells, Golgi vesicles coalesce at the former metaphase plate, forming a phragmoplast. A cell plate formed by the fusion of the vesicles of the phragmoplast grows from the center toward the cell walls, and the membranes of the vesicles fuse to form a plasma membrane that divides the cell in two. In plant cells, a new cell wall must form between the daughter cells. During interphase, the Golgi apparatus accumulates enzymes, structural proteins, and glucose molecules prior to breaking into vesicles and dispersing throughout the dividing cell. During telophase, these Golgi vesicles are transported on microtubules to form a phragmoplast (a vesicular structure) at the metaphase plate. There, the vesicles fuse and coalesce from the center toward the cell walls; this structure is called a cell plate. As more vesicles fuse, the cell plate enlarges until it merges with the cell walls at the periphery of the cell. Enzymes use the glucose that has accumulated between the membrane layers to build a new cell wall. The Golgi membranes become parts of the plasma membrane on either side of the new cell wall (Figure 4). Figure 5. 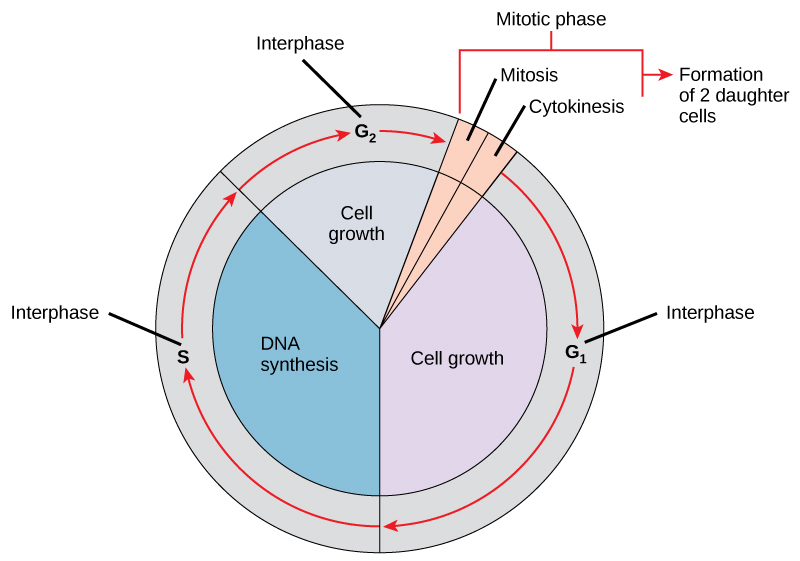 The cell cycle consists of interphase and the mitotic phase. During interphase, the cell grows and the nuclear DNA is duplicated. Interphase is followed by the mitotic phase. During the mitotic phase, the duplicated chromosomes are segregated and distributed into daughter nuclei. The cytoplasm is usually divided as well, resulting in two daughter cells. As you can see, cells spend most of their time in interphase. This video reviews all the steps of mitosis; seeing it all together is a great review at this stage.